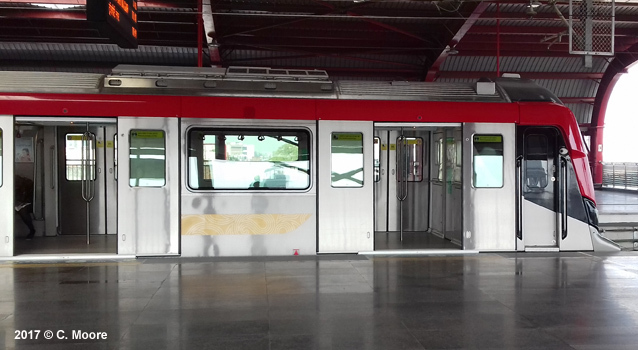 Alstom rolling stock with Alstom’s URBALIS 400 CBTC (communication based train control) signalling system. 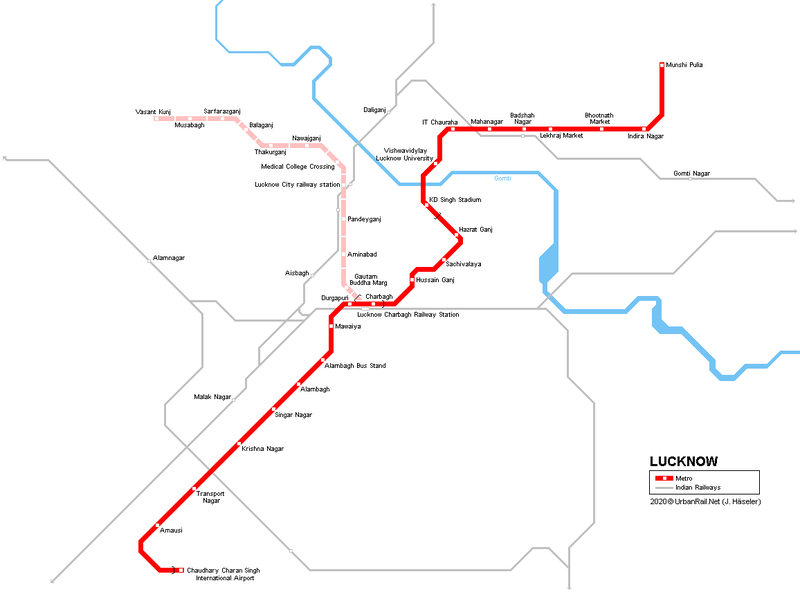 Built at record speed, Lucknow Metro is currently the youngest Metro in the world. 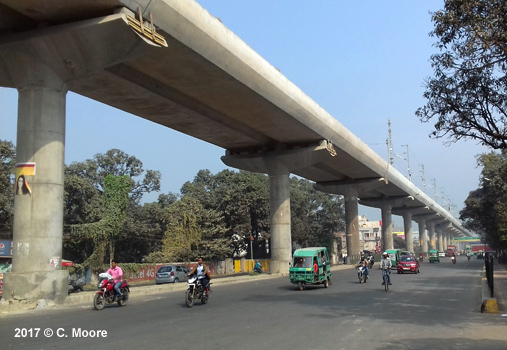 Opened in early September 2017, the 8.5km (8.3km revenue length) elevated line runs from Charbagh Railway Station south-westerly above the Kanpur Road to Transport Nagar, where it will eventually be extended to the airport. 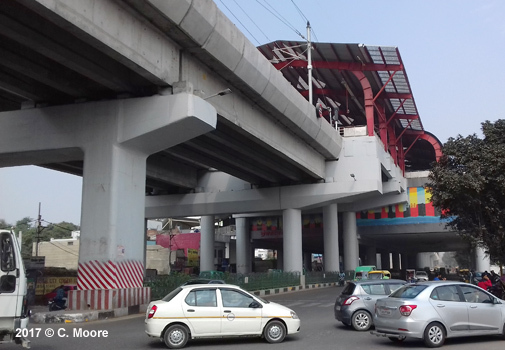 Operated by Lucknow Metro Rail Corporation (LMRC), the elevated line is easy to spot above the typically hectic streetscape, with entrances at both sides of the road. 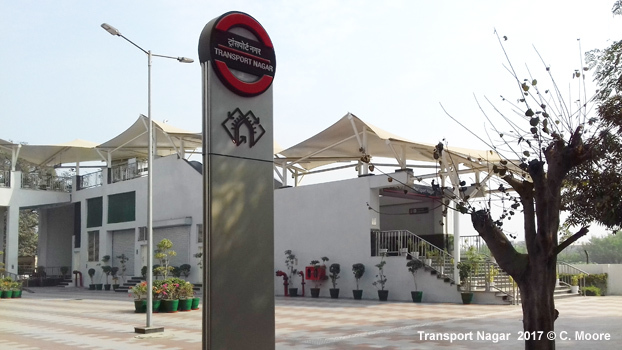 There are large red station titles above the road and passenger entrance stairs have a smart totem and are covered with angular white awnings, and surrounded by smart paved tiling which give it a modern and bright feel. 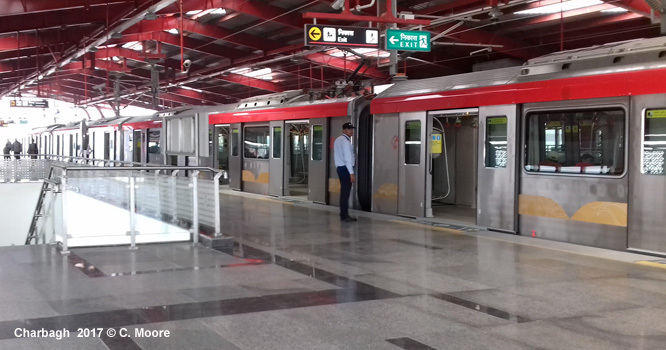 Given its young age, it is no surprise that things are clean, but on entering the station you do notice how the design features are different from other systems in India. Signage is reversed out and looks modern and stylish. The grey/metallic and red colours dominate and wayfinding is impressive. 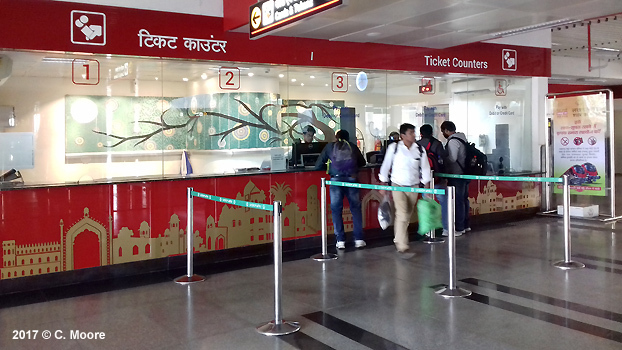 On the first floor is a smart ticket office and customer centre which offers hard-copy information, ticket machines (these, like most places in India are unused – everyone queues and buys from the office), a system map on a metallic background, security machines/staff and very modernistic ticket barriers. 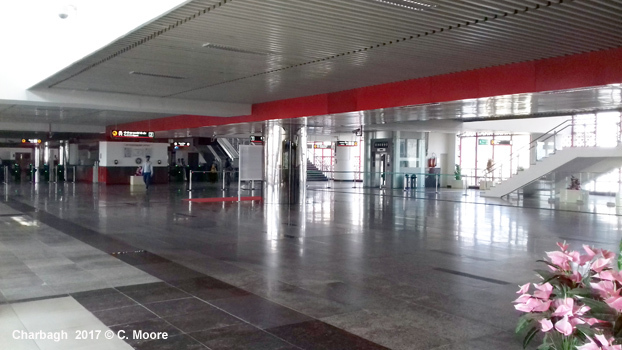 The ticket hall is shiny, cool and airy with mirrored pillars. 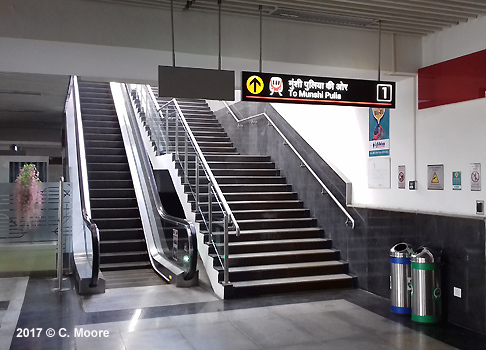 A very broad set of stairs, escalator or lift take passengers to the side platforms above. The platforms are built for 6 cars but the yellow tactile tiles on the platforms show where the current 4-car units stop – it seems this train set-up will be pretty permanent. 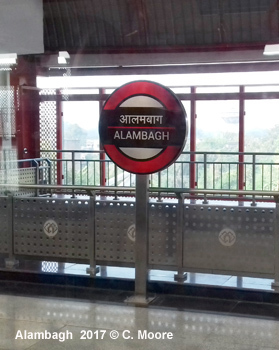 The platforms have RTI (but only for the next train), a horizontal line map (future-proofed with full line) and lovely roundel (like the rest of the system, the roundel is a modern, stylish interpretation of the traditional station identifier in India). 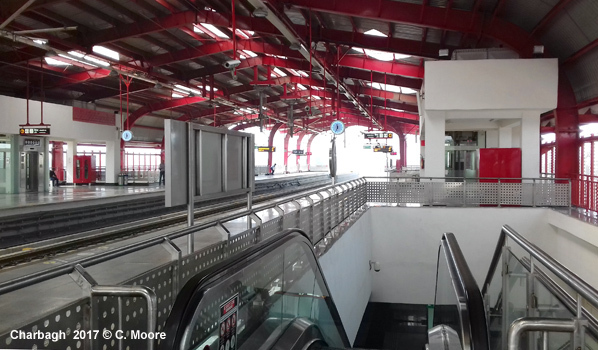 The platforms are deeper in the central part of the station where the stairs/escalator are located but narrow toward the ends. 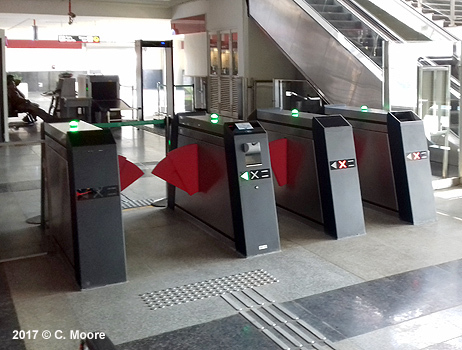 The platforms have grated screens and nice external railings with embossed logo. The whole system is supported by an army of G4S security staff and these are most prominent on the platforms where, armed with a whistle, they stop anything other than standing obediently in a marked zone. You are sadly not allowed outside of the area bordered by the tactile tiles and so can’t go to the ends of the platforms to view the train movements and taking photographs is frowned upon (with a blow of the whistle). The platform area is dominated by the deep red girders that secure the structure and support the corrugated roof above. 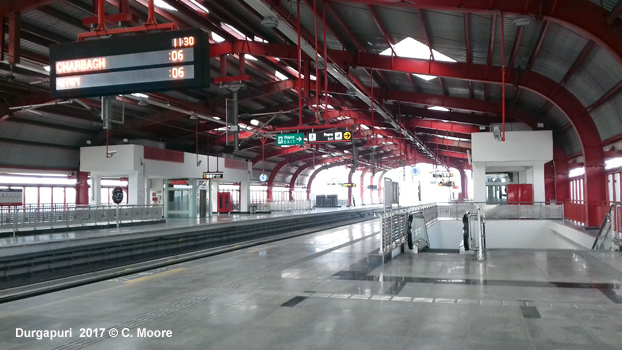 Overall, the stations are appropriately scaled, well designed and have a very nice feel – a good advancement on other such stations in India. 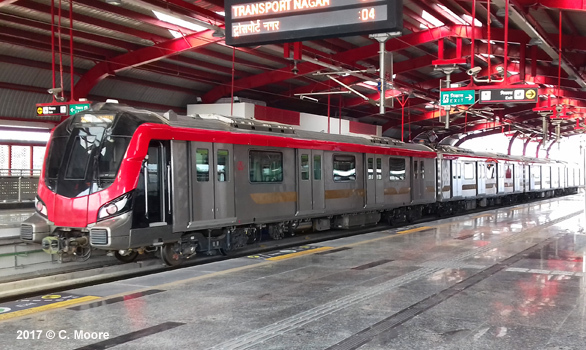 The system uses 4-car Alstom stock (built in India) with a black and red streamline frontage. The interior is very smart with accessible areas for wheelchairs, USB power sockets for recharging, metallic side seating and modern route diagrams. 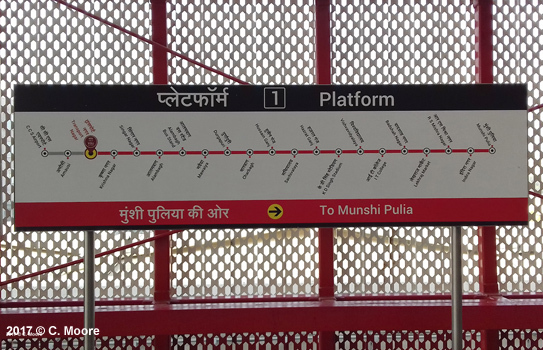 There are LCD displays with times, current and next station, strip maps (one with Hindi-English and dot progression, the other with dynamic information including station names in Urdu to assist the 26% of the population who speak/write Urdu). Audio information is provided in Hindi and English (posh English) only. There are no ‘women only’ areas although a couple of sets of paired seats are allocated in each carriage. 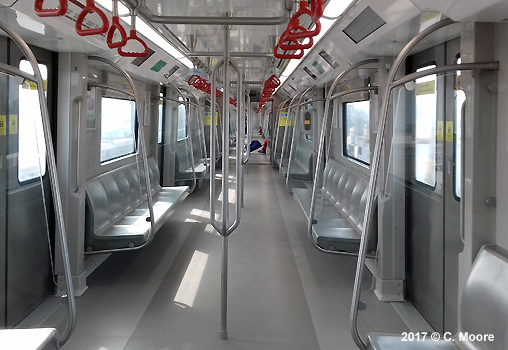 The ride is very smooth, at a decent speed (16min journey) and dwell times are suitable (aided by the whistle blowing platform security staff who hurry people along) and the views of the suburban areas and the frenetic life of the city below are great. 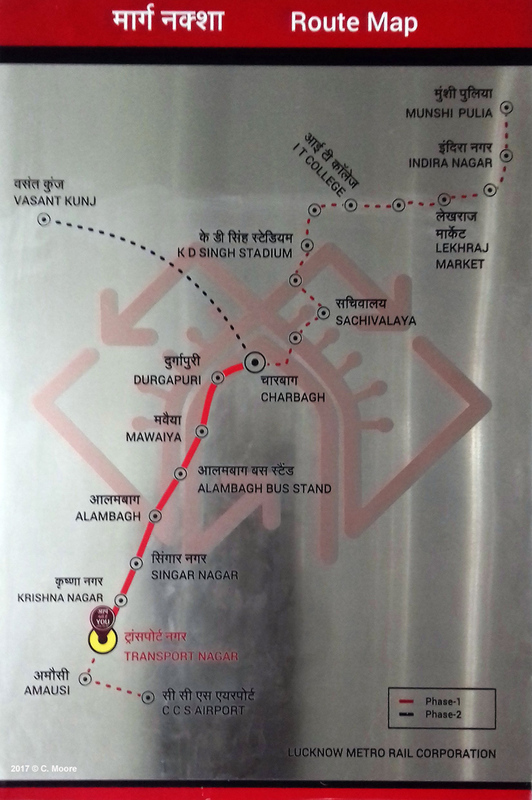 Although passenger numbers are not massive, most footfall is between Singaar Nagar (Nagar = town/locale) and Charbagh. 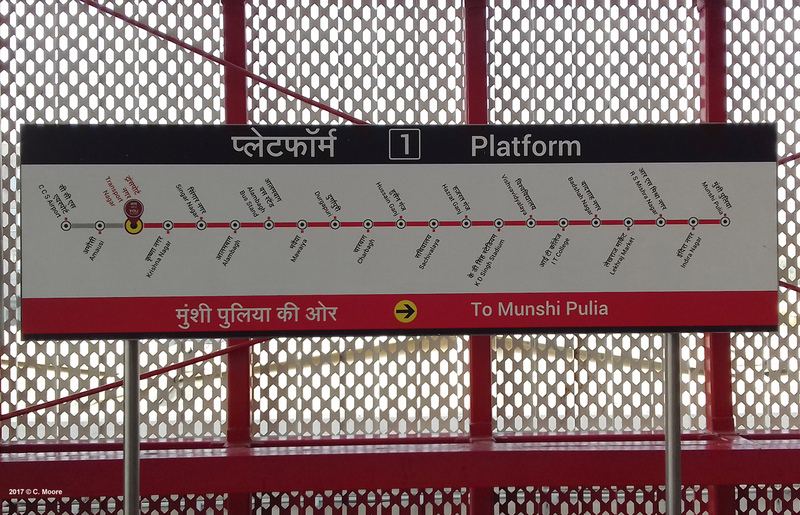 The line is not overly high, but climbs before Durgapuri to cross the main rail tracks before heading east toward the main station at Charbagh, where the train switches to the southern platform before arriving. 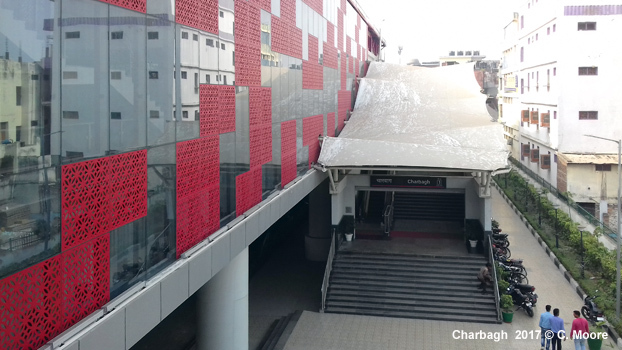 Charbagh station has an interesting glass and grate cladding and also has a side entrance which proudly has directional signage to the Blue Line (this won’t be operational for several years). The entrance hall also has an interesting illustrated display of the evolution of the metro – they are rightly very proud and across trains and platforms, on audio and on hard-copy information there are messages about behaviour and fines (fare dodging brings a prison term!). There is a determination to embed certain behavioural traits to maintain the quality of the system and there is a huge security team to back this up. Services operate from 0600-2200 with 10min headways. 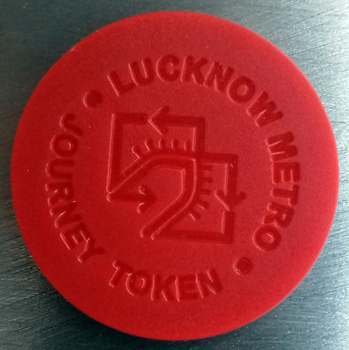 Tickets come in the form of an orange token and fares are distance-based (Day Pass available also). 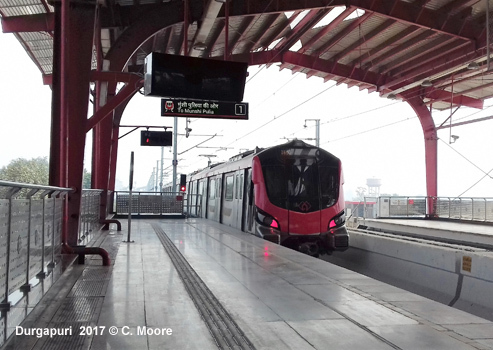 The distance-based fares are 10-30 Rupee (€0.13-€0.39) which, by Indian standards, is very expensive and highlights an interesting dilemma that Lucknow Metro has (as do other Metros in India). 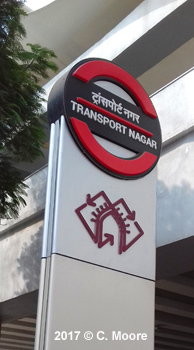 The symbolism brought by the Metro in terms of modernisation and optimism in the future direction of the city/country often do not meet the needs of the vast majority of the population – it only serves a segment of the population (albeit the wealthy and influential – just a thought). In summary, the system is all very new and it will no doubt age but LMRC have made bold steps in design and image and have policies in place to try to maintain the system. The approach has been really well executed and it is quite a leap forward compared to recent openings in India (see Jaipur). It is a system the city should be proud of, certainly more so than being the birthplace of Cliff Richards. 2012 © UrbanRail.Net by Robert Schwandl.